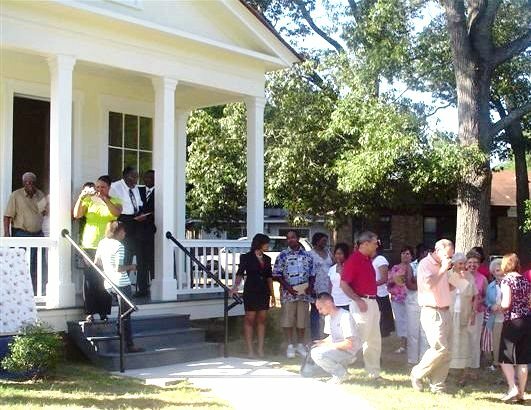 Camden's historic Leake-Ingram Building (1860), which became a Freedmen's Bureau Office in 1865, was rededicated in June 2009 as part of local Juneteenth celebrations following restoration and interpretation. Camden, Arkansas, (population 13,154) located on the banks of the Ouachita River, was originally known as Ecore Fabre, for one of its earliest settlers. Starting in 1824, cotton was shipped from here to New Orleans, and a mill was built in 1841. In 1843 the town became the county seat and its name was changed to Camden. Peter McCollum, a merchant, built a home on a hill overlooking an overland trade route in 1847. This home was later purchased by John T. Chidester and became the headquarters for the Chidester Stage Line. Camden was incorporated in1849. Camden was the major cotton shipping terminal in Southern Arkansas, with as many as four steamboats arriving daily in its heyday. During the Civil War, Camden was a Confederate stronghold. It was occupied for 13 days by Union forces in the spring of 1864, during which time the Battle of Poison Springs took place west of town. The Leake-Ingram Building, constructed as a law office in 1860, was converted in 1865 to a Freedmen’s Bureau office, providing help to African Americans after their emancipation. The classical building became Camden’s first public library in 1906. Local efforts have now restored and interpreted this important historic resource, opening it to the public with a dedication ceremony in June 2009 as part of local Juneteenth celebrations. After the turn of the century, manufacturing became an important sector of the local economy. The International Paper Company and other major companies operated in Camden. Many locally manufactured products, including Camark Pottery and Grapette soft drinks, became well known and are featured in displays at Camden’s restored 1913 Missouri Pacific Depot, now a visitors center. Camden offers driving tours of more than 20 historic homes listed on the National Register of Historic Places, including the McCollum-Chidester House Museum. An annual Daffodil Festival gives visitors a variety of activities to enjoy, including a Civil War encampment re-enactment and a walk through Camden’s historic Oakland Cemetery, where more than 200 Confederate soldiers are buried. Murals depicting the rich history of the area can be found along scenic Route 7, which runs through Camden.